Eighteen-year-old Canadian racer Roman De Angelis got his quest for the 2019 Porsche GT3 Cup Challenge USA by Yokohama Platinum Cup championship off to the best possible start Saturday afternoon at Barber Motorsports Park with a flag-to-flag victory in the 45-minute, season-opening race. Driving the Yokohama-shod No. 79 Kelly-Moss Road and Race Porsche 911 GT3 Cup, De Angelis started from the pole position and comfortably pulled away from the field throughout the race. He led every lap en route to a 17-second victory over series rookie Riley Dickinson in the No. 53 Moorespeed Porsche. It was De Angelis’ third victory in the GT3 Cup Challenge USA Platinum Cup class for 911 race cars built between 2017 and 2019. It also was the second consecutive year that De Angelis – whose car carries a Racing for Children’s livery in support of the Children’s Hospital of Alabama – won at Barber Motorsports Park. “I think the key to that was, one, pulling out a good gap in the beginning, which I think we executed pretty well,” De Angelis said. “After that was just really managing traffic. This is a really small circuit, not many places to pass, so getting by these slower guys as quick and as safe as possible was the key. Dickinson came away from his debut race in the series with a runner-up result after prevailing in a midrace battle for second with Parker Thompson in the No. 3 JDX Racing Porsche. Thompson came home third ahead of Max Root, who finished fourth in the No. 7 Wright Motorsports machine. Jeff Kingsley made it two JDX cars in the top five with a fifth-place showing in the No. 16 Porsche. Alan Metni, last year’s Platinum Masters champion for drivers age 45 and over, got a good start to his title defense as well in the No. 99 AM Motorsports/Kelly-Moss Porsche. Metni won the Platinum Masters class and finished sixth overall – battling for position much of the race with Kingsley and also Sean McAlister in the No. 11 JDX car. “I’m really looking forward to racing with and learning from all of the Platinum drivers, including all the young kids,” Metni said. “It’s going to be a fun year. Fred Kaimer came home second in the Platinum Masters class in the No. 23 NGT Motorsport Porsche, while Charlie Luck completed the class podium with a third-place class showing in the No. 45 Wright Motorsports Porsche. Dan Hardee won the Yokohama Hard Charger Award as the Platinum Cup driver who gained the most positions from start to finish. Driving the No. 69 TPC Racing Porsche, Hardee finished 19th overall after starting 29th. 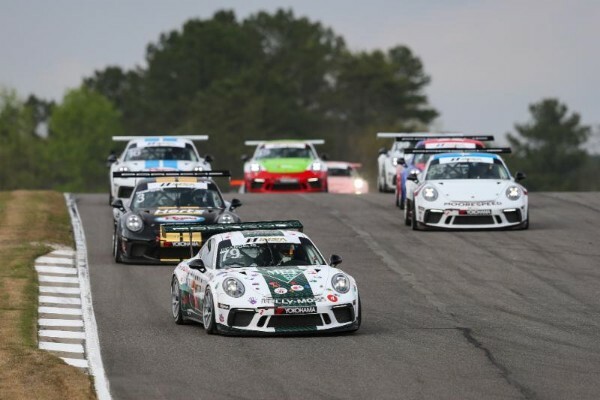 A year after NGT Motorsport driver Victor Gomez IV dominated the Gold Cup championship for 911 GT3 Cup cars built between 2014 and 2016, Sebastian Carazo carried the torch for NGT in Race 1 at Barber, scoring the victory in the No. 27 NGT Motorsport entry. It was Carazo’s first victory. Carazo was the primary beneficiary when Gold Cup polesitter Rob Ferriol was involved in a multi-car incident heading into Turn 1 on the opening lap. The incident removed Ferriol’s No. 5 TPC Racing Porsche from the race, although every other car involved in the incident was able to continue. Kurt Fazekas took second in Gold Cup aboard the No. 52 Kelly-Moss Road and Race entry, followed by Efrin Castro in third place driving the No. 65 ACI Motorsports Porsche. The second 45-minute race of the GT3 Cup Challenge USA weekend doubleheader at Barber as part of the Indy Grand Prix of Alabama weekend rolls off at 11:55 a.m. CT on Sunday. The race will be streamed live on IMSA.tv.